Hello lovelies NICOLA here today with a project to share with you all. I have made an aperture card using a die to create the aperture. I printed off some of the gorgeous flowers from the recently launched PRETTY PASTELS CD I love this cd there are so many beautiful flowers and co-ordinating papers to choose from. I chose to make the card using creams as I wanted to give the card a bit of a vintage feel. I have inked the flowers I cut out with Distress Ink Vintage Photo along with some ROSES too. I have also inked VARIOUS SWIRLS and stamped over them using the sentiment stamp that I have used for the centre of the aperture. The stamp you can buy HERE I did'nt want to waste the die cut from the aperture so I have used this inside the card to mount the lace and the sentiment onto. I finally finished with gold liquid pearls. Don't forget to hopover to the DREAMEES WEBSITE to see all the latest products and special offers! Thanks for stopping by today, happy crafting! Hi everyone, well it has been a bit busy here to say the least, since my last post we have been back to one of our fave venues for the shows - The National Motorcycle Museum in Birmingham - we really do adore it there, the people are so friendly and love to see Dreamees products and love the demos which Hayley treats them to, we sold out of lots of our new products at this first show for us of 2013. Tomorrow we are heading up to Houghton Le Spring near Sunderland for the Ross Papercraft Show, we are excited about this one too as we havent been to this venue ( Rainton Meadows ) for a few months, we have lots of new products to show our customers up there which I am sure they will love. First of all I started with a 13cm square card blank. Distressed the edges of the base card using walnut stain distress ink pad. I then printed some backing papers from the cd , matt and layered these onto the base card,.I then cut a square and a rectangle to use as matt and layers to add interest to the base before I added the topper , in this case it was a sentiment from the cd to act as topper. I used a Martha Stewart punch to cut edges for the square and rectangle. I have used a spellbinders die to cut out a white flower shape, then the size smaller of the same die over the sentiment which I wanted to use from the cd. I then distressed these pieces with walnut stain again. I added the square and rectangle to the base card as you can see in the pictures. I then cut various flowers from the cd in the colours Brown and Teal, to make the display in the bottom left hand corner. I also cut some leaves out from out Cuttables range of cds which are aimed at people with computer cutting machines like the craft robo and cameo as these cds use gsd files. I then did a stitching effect around the large spellbinders shape just to give more interest. Putting everything in place I used double sided tape and sticky pads to raise certain aspects to give texture too. I then cut 3 small pieces of ribbon and just stuck them unde the shaped edge under the square shape. then just adding peals to the points of the flower shap die cut, and the centres of the flowers. The card is now complete on the front. For the inside I made a simple tag covered it again with papers from the cd added a bit of ribbon too. I then covered the inside of the card by matt and layer with two backing papers, made a strip across the inside of the card to slide the tag into. The card is now complete. Thank you for taking the time to have a look at this project. Hello lovelies, NICOLA here with a project for you today! I have made a card using the BLOOMIN BRIGHTS CD and I chose to use all purple. I wanted to make a birthday card. I have matted decorative backing paper from the cd onto matching card. I absolutely love this flower paper so I didnt want to cover it too much, that is why I chose to add a circle sentiment as shown so as not to detract from the beauty of the paper. I added a satin ribbon border and printed a flower bow and a purple bow from the cd, cutting just the bow part from the purple one and not the ends. I fixed this over the flower bow with foam pads and added a flowery heart from the cd in the centre of this. I have embellished with gorgeous PAPER FLOWERS and a butterfly. To finish I added a dot of Lavender Stickles around the edge of the card. There are lots of exciting times ahead for Dreamees so make sure you follow the blog so you can keep up with all the latest exciting news and product releases! Hello and happy Monday to you all, hope you are having a great start to the week! Unfortunately it is very dark and gloomy here today so i apologize for the pictures, i will try and retake them. 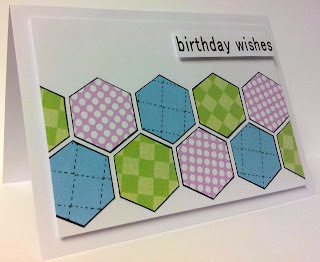 Hexagons seem to be very in vogue in fashion and in the crafting world and i love them too! 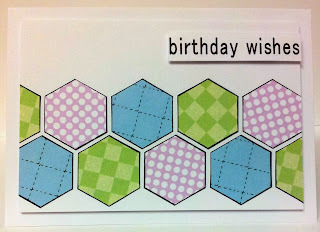 Dreamees have a lovely new Hexagons Stamp Set, i simpled stamped the outline hexagon onto some papers from the Back To Basics CD, cut them out and added them to a white panel. The sentiment is also on the Back To Basics CD too. I then popped up the whole panel on 3d foam. Hope you enjoyed my fast & simple card today.